THE BEAUTY AND THE BEAST REAL ROSE IS A PURE FAIRYTALE. GIVE THIS MAGIC GIFT TO SOMEONE! Inspired by a romantic fairytale about the beautiful Belle and the enchanted prince Adam, this eternal love flower was created. Rose looks the same as the original one- bright and fresh. With the help of scientific research, it has been possible to derive a unique formula that allows the plant to stabilise and slow down all the vegetative processes in it. This formula makes it possible to enjoy flawless beauty for long five years! It seems unreal, but such a flower does not need to be watered at all, sunlight and any maintenance. The long lasting impression is The Gift! We choose only perfect flowers with huge buds and large petals. Rose from “The Beauty and the Beast" fairytale will be an excellent expression of your love and affection. Such a gift has a romantic implication - according to the fairy tale, this item was enchanted and belonged to the sorceress and symbolised Prince Adam’s heart. 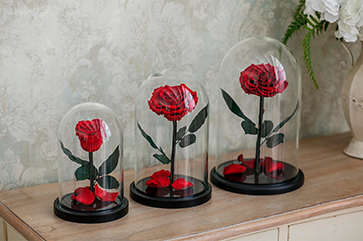 “The Beauty and the Beast” real rose in a glass dome would be a symbol of your warm feelings for a loved person, and would clearly demonstrate your creativity and insight. 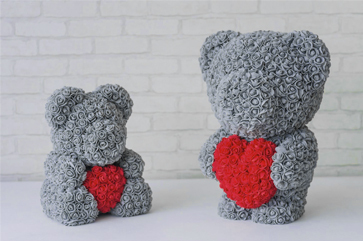 Do not forget about special words of love when presenting the gift - such a souvenir is usually presented to the most loved ones! WHO CAN BE A HAPPY OWNER OF A THE BEAUTY AND THE BEAST ROSE? The very fact of giving such a gift is admirable. It's really a beautiful thing that just has to take the most prominent place in the house. You can watch it for hours and at the same time admire how real it looks. Girls will be delighted if you show your affection in this way. “The Beauty and the Beast” real rose is available in different sizes and colours. 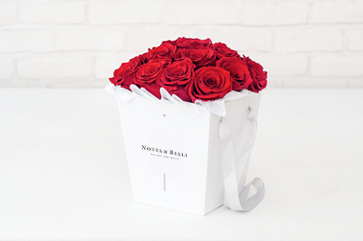 Surprise your partner with an unusual colour rose! Little princesses should also receive flowers! You will make a good choice, if you decide to give such a fabulous present for a birthday, March 8, or a New Year. Just warn a little lady beforehand that the glass dome protecting the plant is quite fragile and you need to handle it carefully! Women have hardly ever seen this innovation in the floristry field. Become a magician for them! Your mother and grandmother would related to everyone how you brought them this really magic gift! You can add a service of creative engraving or order a personalized one for the gift. WHERE CAN I PURCHASE THE FAIRY TALE FLOWER? You can order a real rose from the Beauty and the Beast fairy tale on our website online catalog. 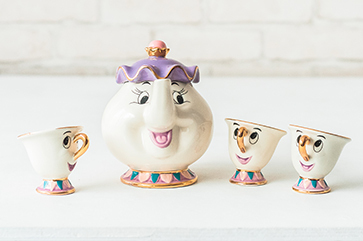 There is a wide range of assorted positions for "The Beauty and the Beast” rose in a glass dome" - just choose the one you like and place your order.